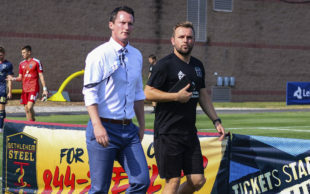 Bethlehem Steel FC head coach Brendan Burke has successfully completed his United States Soccer Federation A – Senior Professional license, reminding readers that not only are players being overtly developed by Bethlehem, coaches are also. When asked to describe the license curriculum and what he learned from its process, Burke said there were two instructors and five candidates who met together three times, for five to seven days at a time, and that each candidate had an onsite assessment visit of one or two days. At least one of the sessions occurred during the season, along with the onsite visit. The entire process took most of the 2018 season. There were assignments to be completed during the intervals between the three sessions, according to the USSF announcement advertising the course. Burke said further that each of the five candidates, at the time the course began, were USL head coaches. It was the first time in his licensing experience that all candidates shared equal backgrounds, a beneficial characteristic he enjoyed and would recommend for future courses should it be possible. Given the class size and its homogeneous background, its style was open forum discussion. The instructors provided plenty of direct instruction material, he said, but clearly it was an open conversation among five younger practitioners of the coaching art and two older ones. Burke’s description, together with the course’s announcement, indicate these specific topics were the curriculum. He indicated that greater attention was paid to issues faced weekly, rather than longer-term strategic thought. The course’s instructional style leads directly to the most important thing he gained from the experience, the relationships with the six other participants. He said he feels entirely comfortable with calling any one of them for counsel about any circumstance he is facing or is about to face, and he hopes they feel the same about consulting him. The new credential strengthens the impressive resume Burke is building at the professional level. The two major changes placed in front of him for 2019, moving to a new game venue and playing the schedule with a distinctly younger roster, will challenge his professional development further.